IISD Reporting Services (IISD RS) has produced daily web coverage and a summary report from this meeting. To download our reports, kindly click the HTML or PDF icons below. 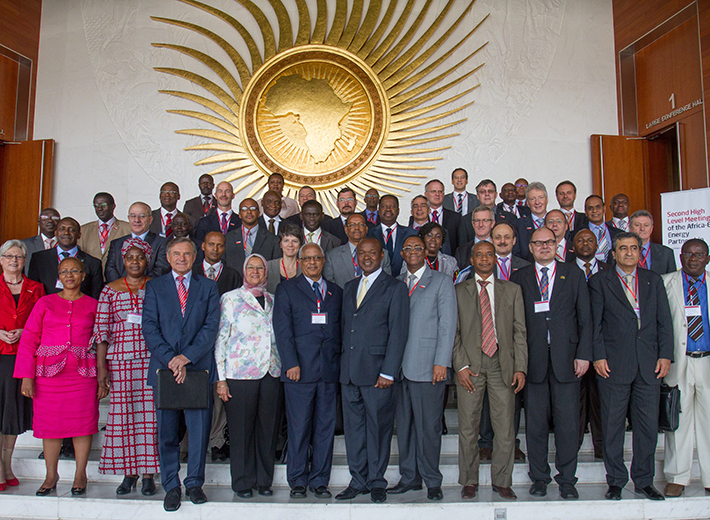 The second High-Level Meeting (HLM) of the Africa-EU Energy Partnership (AEEP), ended on Thursday, 13 February 2014 in Addis Ababa, Ethiopia. During interactive plenary sessions as well as parallel thematic discussions over the three days, which were organized in pre-meeting side events, an “Expert Day” and a Ministerial Segment, delegates reviewed progress in implementing the AEEP 2020 Targets and discussed how to shape future Africa-EU relations in the energy sector. 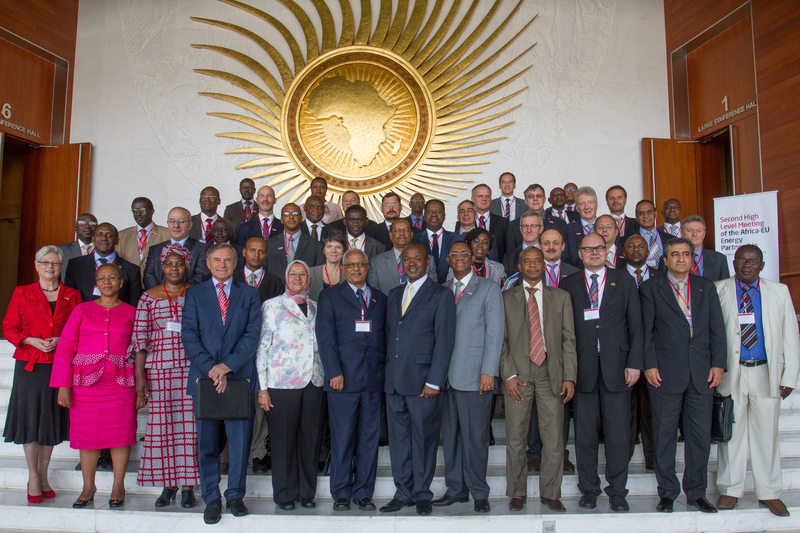 The meeting was jointly hosted by the Ethiopian government and the African and European Co-Chairs of the AEEP: the African Union Commission (AUC) and European Commission, and the governments of Austria, Germany and Mauritius. At the closing session of the Ministerial Segment on Thursday, participants approved the “Addis Ababa Communiqué,” which defines the partnership’s priorities and vision for African-European collaboration on energy affairs. The Communiqué contains nine recommendations for accelerating access to sustainable energy on both continents and achieving the AEEP Targets, as well as four key messages to be forwarded to African and EU Heads of State and Government at the EU-Africa Summit in April 2014. The Ministerial Segment of the Second High-Level Meeting (HLM) of the Africa-EU Energy Partnership (AEEP) convened in plenary discussions throughout Thursday. During the opening session in the morning, delegates heard welcome statements from Alemayehu Tegenu, Minister of Water, Irrigation and Energy, Ethiopia; Elham Ibrahim, Commissioner for Infrastructure and Energy, AUC; Andris Pielbags, EU Commissioner for Development (by video message); Christian Schmidt, Deputy Minister, Federal Ministry of Economic Cooperation and Development, Germany; and Andreas Melan, Ambassador of Austria to Ethiopia. The session closed with inspirational messages from Kandeh Yumkella, UN Special Representative on SE4ALL, and Erastus Mwencha, Deputy Chairperson, AUC. Participants then convened in two plenary discussions bringing together African and European Ministers and heads of partner international institutions to assess the achievements of Africa-EU cooperation in the energy sector and consider concrete actions to take action, mobilize commitment and coordinate efforts towards the AEEP and SE4ALL targets. This was followed by a business and policy leaders roundtable which discussed ways to improve public-private collaboration to attract and substantially accelerate private investments to meet the AEEP 2020 Targets. During a final plenary session in the afternoon, participants considered draft text of the AEEP-HLM outcome document, the Addis Ababa Communiqué, which contains nine recommendations for accelerating access to sustainable energy on both continents and achieving the AEEP Targets. The Communiqué also contains four key messages to be forwarded to African and EU Heads of State and Government at the EU-Africa Summit in April 2014. Participants then viewed a short video prepared by young environmental journalists attending the meeting with their impressions of the discussions. The ministerial segment concluded with final remarks by Minister Alemayehu Tegenu, and Director-General Klaus Rudischhauser, DG Development and Cooperation, European Commission. Visit the web coverage for Thursday, 13 February 2014. The official opening session of the Second High-Level Meeting of the Africa-EU Energy Partnership (AEEP) took place on Wednesday morning, with welcome speeches by: Aboubakari Baba Moussa, Director of Infrastructure and Energy Department, AUC, for the AEEP African Co-Chair; Franz Marré, Head of Division, Water, Energy, Urban Development, Geosciences Sector, Federal Ministry of Economic Cooperation and Development, Germany, on behalf of the European Co-Chair, Germany; Ambassador Gary Quince, Head of Delegation of the European Union to the African Union; and H.E. Elham Ibrahim, Commissioner for Infrastructure and Energy, AUC. Participants then convened in a plenary session titled “The Road from 2010 to 2014: Developments of the Africa-EU Energy Partnership.” The session reviewed the origins and history of the AEEP and highlighted key milestones in the partnership so far, including the convening of Stakeholder Consultations and implementation of the Africa-EU Renewable Energy Cooperation Programme (RECP). The session concluded with a presentation and discussion of the AEEP Status Report on progress, achievements and future perspectives in achieving the AEEP 2020 Targets. In the afternoon, participants met in plenary for a thematic panel discussion titled “Chicken and Egg?”: Enabling Environment and Energy Investment Projects.” Thereafter, participants convened in three parallel sessions addressing: energy access; energy security and regional integration; and financing renewable energy projects. In the evening delegates attended a gala dinner organized by the Ministry of Water, Irrigation and Energy, Ethiopia. Visit the web coverage for Wednesday, 12 February 2014. Delegates at the Second High-Level Meeting of the Africa-EU Energy Partnership (AEEP) participated in side events and stakeholder consultations on Tuesday, 11 February. In the morning, a session co-organized by Practical Action, the Kumasi Institute of Technology Energy and Environment (KITE) and Hivos focused on accelerating inclusive energy access solutions and policy through partnerships with civil society. Participants discussed a draft civil society statement to be appended to the meeting declaration. Two stakeholder workshops also took place in the morning to review progress in the implementation of the Africa-EU Renewable Energy Cooperation Programme (RECP); and provide input for a draft mini-grid policy toolkit developed by EU Energy Initiative Partnership Dialogue Facility (EUEI-PDF), Renewable Energy Policy Network for the 21st Century (REN21) and the Alliance for Rural Electrification. In the afternoon, participants met in two parallel sessions on: the role of data collection in energy investments, policymaking and access; and financial models and private-sector case studies on rural electrification. Visit the web coverage for Tuesday, 11 February 2014.